We first fell in love with the Royal National Theatre about five years ago, when we participated in a month-long study abroad focusing on London theater. The National is such an energetic and progressive space for theater. It present fantastic, on-point productions in a diverse, democratic space, and, since it receives public funds, tickets can be bought for half the price of a regular theater ticket, if not less. And now, starting in 2009, the National launched NT Live, a program that films some of the National’s most in-demand stage productions and broadcasts them live to cinemas around the world. It’s an innovative program that hopefully will be adopted by other prominent theater companies, not only to further promote and spread excellent theater, but also to preserve it. Theater is a far less accessible medium than film, for reasons of cost, specific location, and specific duration, and any opportunity to enhance the theater’s audience and ensure a production’s longevity should be taken. Since it start, NT Live has increased its accessibility among international audiences, with screenings of noteworthy productions like Frankenstein (starring Benedict Cumberbatch and Jonny Lee Miller), Coriolanus (a Donmar production starring Tom Hiddleston), and soon-to-be Broadway productions like The Curious Incident of the Dog in the Night-time, The Audience, and Skylight. 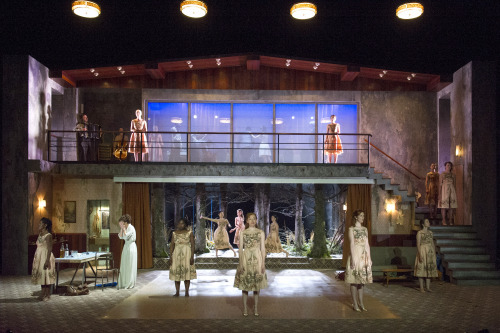 You’d expect no less from a forward-looking company than this powerful production of Euripedes’ Medea. Using a new translation by Ben Powers, Carrie Cracknell directs Helen McCrory in the title role. McCrory is a powerhouse actress with a knack for playing turbulent and/or conflicted women. She adds a quiet and authentic severity to Medea, and is more than capable of tacking the physical and emotional demands of the role. Unlike most tragic heroes, Medea begins already grief-stricken, with a history of conflict and violence long enough to fill its own Greek tragedy. Out of love for Jason, the Greek adventurer and leader of the Argonauts, Medea again and again saved his life using ancient magic and strategy throughout his quest for the Golden Fleece. She killed and dismembered her own brother in order to provide a distraction for Jason’s escape. Jason (Danny Sapani) is now Medea’s husband and father to her two children. Her new grief is due to the newly announced marriage of Jason and Glauce, King Kreon’s daughter. Jason rationally argues that this new marriage is a political and economic ploy to ensure the the protection of Medea and his sons. But Medea refuses to see the marriage as anything but betrayal. Historically, rationality has been seen as a male trait and superior to female emotion. Here, Jason’s emotionally distant logic counteracts Medea’s deeply rooted, instinctual fervor. She envelopes herself in grief and plans her revenge. To make matters worse, Kreon (Martin Turner) banishes Medea, a threat to the happiness of the kingdom. What struck me about Medea’s eventual decision to murder her children is how she must adopt the same oppressive patriarchal logic in order to execute the plan, abandoning her instincts and alienating her actions from her feelings. It is her mind, not her emotions, that brings about this atrocity. 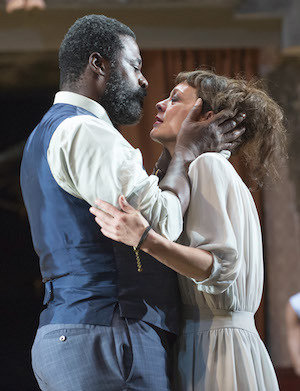 This is clear in Helen McCrory’s beautifully executed soliloquies debating the act, revealing the psychological twists and turns of her motives. For me, this is the triumph of the play, this rationalization of the murders that mirrors the rationalization of the male authority figures. This adoption of male logic, as opposed to her abundance of emotion, is the perpetrator of her actions. This production is set in a modern home, albeit a crumbling one. The dirty, peeling patterned wallpaper and 70s-style tiled floors give the house a look as if it hadn’t been cared for in years, the result of years of neglect, even though Jason’s marriage to Glauce has only been just announced. It gives one the feeling that this oppressive grief, this anger, is a deep-seated one that has always been latently present, but only recently surfaced. Knowing what we do about Medea’s history with Jason and ancient Greek patriarchy, it is clear that Medea’s betrayal is only one face of female sacrifice, of the abuse of male power, and of a (perhaps unconscious) long-lasting resentment between the sexes and neglect of feminine humanity. This latent anger is further emphasized by the way that the set gives way to a lurking forest in the background. Atop the house is a hall walled with glass, the scene of Glauce and Jason’s wedding party. Structurally, the forest may be like the lurking subconscious, the otherworldliness of Medea’s mysticism and powerful emotions (She is traditionally seen as a representative of the old mystic, uncivilized world of witchery and magic, while Jason ushers in a new structured civilized age). It is the unbridled rawness of human nature, the id, if you will. If Medea’s home is the ego, struggling to balance her emotions with her thoughts, then the glass hall above is the superego, the civilized, the home of rationalism, logic, and ideology. It is the realm of the accepted status quo, that which has been deemed correct by the patriarchal hierarchy of Greece. The chorus of this production is comprised of the women of Corinth, the bridesmaids at Glauce’s wedding. They comment on Medea’s actions, but they too struggle with the emotional and psychological contradictions of patriarchy. Accompanied by a chilling score written by Alison Goldfrapp and Will Gregory, the chorus convulsively dances at pivotal points in Medea’s plan, their bodies becoming symbolic incarnations of Medea’s mental state and of the psychological distress that exists in the psyches of oppressed peoples. Sometimes the choreography seemed too much like break-dancing (there were a few giggles in the audience in one scene) but its purpose was clear. To find local screenings of NT Live’s Medea, as well as upcoming NT Live productions, visit their website here.